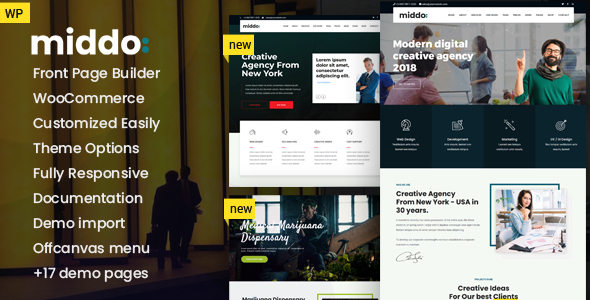 Middo – Modern & Clean WordPress Theme is made on _s, bootstrap, bones, Redux Framework for Theme Options, bbPress ready, Fully Responsive Layout, perfect for creative websites, business websites, corporate agency, seo websites, portfolio, startups, landing page, business website, technological corporations and digital marketing agencies and more. We use Front Page Builder Editor (Blox Page Builder free version with customs addons) with fuctions like drag & drop, copy/paste row, settings for addon/column/row on desktop/tablet/mobile all from Editor side and more. Get high quality designs in under 5 minutes. Use our drag and drop page builder to create unique designs suited exactly for your needs. Blox Page Builder is a stand alone plugin that is compatible with any theme, and can be used to create beautiful and fluid layouts inside content areas of any size and shape. In our pack (zip downloaded from your account) you can find XML Import file and you can import all using WordPress Import tool plugin, also you can find all pages that you can import in page builder. In WordPress Import section, choose our file xml and import it; From Page sections, just Import our blox pages and your done! In our pack, please check our documentation. In documentation, you can find all about Middo template, how to install manually, how to install demo, how to change colors and more. 2. From Themeforest – Your account – Download section, choose to download all files. 15. Now you can visit Middo Options to enable top bar, footer, upload logo and to make changes. Also download entire pack with name middo_wp.zip, unzip it using Unzip Free Software and here you will find: Theme Middo.zip, middo-child.zip, Documentation (open file index.html in browser and use browser scroll), Import folder.